This article compares the tillers and rotovators available in the UK. Prices, performance and usability are all reviewed in detail. The price range we have concentrated on is the £250 to £700 range which will buy you a very good tiller if you choose wisely. Weight, ease of use, guarantee / warranty periods, engine power, type and much more are all discussed in depth by our experts. The comparison below is in alphabetic order of manufacturer, if you know one we have missed then contact us so that we can include them here. Prices are without any discounts. At the beginning of this comparison we have a section with all the points you need to consider before buying your garden tiller. It's definitely worth a read and may well save you time and money in the long run. Remember whilst reading this review, we DO NOT SELL TILLERS! What this article aims to do is to inform you, not sell to you. Not a quality you find in many other websites we know, but it's the truth. PRICE RANGE - set a lowest and highest price range and stick to it. Click here for our list of popular tillers by price. GUARANTEE - how important is the guarantee to you? If it's important to you, stick to the big names such as Mantis, Honda, AL-KO etc., they have reputations to protect. If a guarantee is not so important to you then you are able to take a risk and consider some of the not so well-known names at discount prices. WEIGHT AND EASE OF LIFTING - how important is this to you? For example, some tillers have powerful engines and even two gears but they can be heavy and difficult to lift and move. Others are less powerful but lightweight, easy to manoeuvre and lift. For women in particular, weight of the tiller can be a factor which is of key importance. Click here for our list of popular tillers by weight. ENGINE POWER - for some, engine power is the prime factor in buying a tiller, an important factor if you want it to deal with uncultivated ground. See our individual reviews below for details of the specific power of each model. Having answered those questions you will now find your choice of garden tiller so much easier. Use the summary of models below to help you decide and click on any model for a much more detailed review of it. All the detailed reviews have individual pictures of the model being reviewed. AL-KO is a family run firm which was first established in 1931. The range of garden tillers is designed in Germany and they claim a good reputation for innovation and ease of use. This is the entry level garden tiller in the AL-KO range but still has a relatively powerful Briggs and Stratton 148cc engine. Its small size makes this model a good choice for maneuverability but at 26kg / 58lbs this is not a machine that can easily be lifted. A manufacturer's price of £399 can be reduced a little if you shop around (see the full review for the cheapest supplier). Read the full review of the AL-KO MH 350-4 tiller here including the key statistics, ease of use, warranty, reliability, cheapest prices and more. One of the few tillers available with a reverse gear which helps greatly in small spaces. A powerful engine and 50cm ploughing width are well matched. Weight at 46kg / 101lbs makes this a very heavy machine which is good for stability in use nut not so good if you need to lift or transport it. The manufacturer's recommended price of £620 can be reduced, the best buy we could find was at Amazon, click here for their discounted price. Read the full review of the AL-KO MH 5001 tiller here including the key statistics, ease of use, warranty, reliability, picture and more. A large Briggs and Stratton engine size of 205cc gives this tiller a wide ploughing width of 75cm, the largest of all the ones we have reviewed. It's also the heaviest at 51kg / 112lbs (also handles are not foldable) but the reverse gear helps greatly with manoeuvrability. The recommended retail price is £699, the cheapest we could find it was again at Amazon - click here. Honda has a well-earned reputation for manufacturing garden tillers / rotovators which are built to last. Their warranty is a massive five years for domestic use, one of the longest there is for a garden tiller. Be clear though, that guarantee only applies if you have the machine serviced by a Honda dealer and that will cost you around £80 a year - very expensive. Prices are mid-range for the performance but for that you get a very well designed piece of equipment which many gardeners recommend. The Honda range of tillers are heavily discounted by some online suppliers. Spares are expensive for Honda tillers and their instruction manuals contain very little information, certainly not enough to identify a spare part number. If anything goes wrong, although it rarely does, then it's a costly trip to your main dealer. This is the smallest of all the Honda tillers but it is also the most popular. Weighing in at only 14kg it's easy to manoeuvre and also easy to carry. Although the handles are foldable for easy storage they are not adjustable for height, something to bear in mind if you are are particularly short or tall. The recommended retail price by Honda is an optimistic £469 but we found it being sold for much less here. Read the full review of the Honda FG110 tiller here including key statistics, picture and where to find the cheapest prices. At double the engine size of the smaller version this model has more power and has a larger ploughing width of 30cm. The range of accessories is impressive with transport wheels, de-thatcher, lawn edger, aerator and many more. Even with all that power this is still an easy machine to lift up and put in the boot of your car - total weight is a very reasonable 16kg / 34lbs. The full price which Honda would charge you is £579 but several online retailers, Amazon for example, offer it for sale at a discounted price. Read the full review of the Honda FG201 tiller here including full statistics, picture and where to find the cheapest prices. Although Husqvarna are a very large worldwide company their range of three branded tillers has only a small impact on the overall tiller market in the UK. They have a range of three tillers. This tiller is one of the lighter ones on the market but aside from that has little to distinguish itself. The engine is a Subaru and the recommended retail price is £500. Read the full review of the Husqvarna T300RS including full statistics, picture and where to find the cheapest prices. 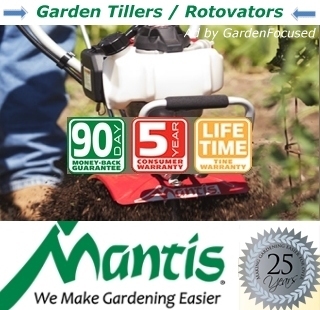 Mantis are almost unique in the garden tiller world because the company is very focused on manufacturing and selling garden tillers / rotovators. The range consists of five models and they are aimed fairly and squarely at lightweight tillers. If your looking for a reliable tiller that can be picked up easily and that also is easy to use then Mantis tillers may be for you. They come with a full range of accessories for easy lawn care and weeding. Mantis tillers are available to buy through the company's main website or through other online companies. Check the prices carefully because often the main website is cheaper than other online companies. Getting spare parts for your Mantis tiller is simplicity itself because the manuals are very detailed and the spare part numbers are not a "state" secret as they can be with Honda for instance. Prices for spare parts are very reasonable. The Mantis electric tiller is one of the few on the market which can come anywhere near the performance of a petrol model. It is exceptionally light at only 9.5kg / 21lbs and very manoeuvrable, most people will easily be able to lift it in and out of a car boot. It comes with a 10m electric cord and an extension cord is available from Mantis. This model is suitable for small and medium sized gardens and can be used to weed between plants because of its small size and light weight. Recommended retail price is £299 but Mantis are selling them at a discounted price on Amazon here at the moment. Read the full review of the Mantis electric tiller here including pictures and where to find the cheapest prices. The Mantis Classic four stroke petrol powered tiller with the 25cc Honda engine weighs in at a mere 11kg / 24lbs making it the lightest of all the main stream petrol tillers. It is designed to be easy to use and lift, and also operate well in flower and vegetable beds without damaging nearby plants. Over two million of these tillers have been sold worldwide. The normal retail price is £392 although Mantis are offering this model at the lowest discounted price on Amazon here. Read the full review of the Mantis Classic petrol tiller here including where to find the cheapest prices. Mountfield exist in name only, they were taken over by GGP in 2000. The company manufacture a large range of lawnmowers and other garden equipment around the world. The Mountfield Manor Compact 36 is the baby in their range but it still has a sizeable 100cc "Mountfield engine". There are a couple of nagging doubts we have about this tiller and it does not come anywhere near our recommended list. Read the full review of the Mountfield Manor Compact 36 tiller here including where to find the cheapest prices. Stihl are a German company founded in 1927. They have branches in 160 countries and 35,000 individual dealerships, a very large multinational company. They bought Viking in 1992, an Austrian company that still operates from Austria. They specialise in diy, building and gardening equipment. The HB 445 is a hefty piece of equipment weighing in at 40kg / 88lbs and two people are required to lift it in and out of a car boot. The 125cc Briggs and Stratton engine is not only a powerful unit but it is easy to use and cheap to maintain. The 45cm / 18in tilling width is a fair size given the recommended retail price of £700. The cheapest we could find this tiller was £595 at Just lawn Mowers. Read the full review of the Viking HB 445 (R) tiller here including where to find the cheapest prices.